Explorer++ allows you to set data column visibility for folder listings on a tab-by-tab basis. Columns available also depends on the current tab’s folder type. The settings here apply only to the current tab; future (new) tabs adopt the settings from the Default Columns… setting. For more information about column settings, see here. 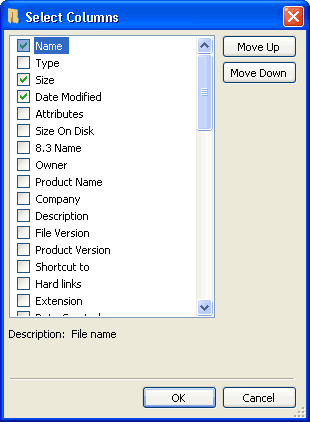 This area shows the list of columns available for the type of folder currently being viewed; checking the checkbox beside the name enables the column in the Files pane. This list of available columns may vary with the type of folder currently being viewed (ie. the active folder for a tab). In addition, while a particular column may be checked, not every file in the folder may possess the type of data placed in that column. For example, image files may show data in the Width and Height columns, but text files will not. In addition, the columns is different for virtual folders, etc, as outline in the lists following. Columns are displayed (left to right in the Files pane) in the order shown, from the top down. The order may be changed using the Move Up and Move Down buttons. Control Panel Windows virtual folder: a collection of applets for modifying your system, etc. General This is a normal (ie. real) folder on your system. This type of folder comprises 99% of what you will view and presents, therefore, the most common list of columns. My Computer Windows virtual folder: shows volumes (ie. drive letters) and some other virtual or system folders, such as My Documents, Control Panel, etc. Network Connections Windows virtual folder: This is actually the Control Panel applet which manages connections. My Network Places Windows virtual folder: This is actually the Control Panel applet which manages connections. Printers and Faxes Windows virtual folder: list of printers, faxes and printer drivers connected to your system. Recycle Bin Windows virtual folder: collection of erased files which are still recoverable. Following is a list of all columns available for the different types of folders which can be viewed. Default columns (with a checkmark in the Def column) and default column order, assigned by the system (ie. order, left to right) ,are also shown. The user may change the default widths (always 150 pixels) through the Save Column Layout as Default menu item. Columns marked as “n/a” (not available) may not be implemented as of this version of Explorer++, ie. they may be present but contain no data. Applies to real files or folders. Not all tags apply to all file types. ✓ 4 Date Modified date of last file/folder modification. Some applications may modify the file without changing this attribute. Date Accessed date of last access (read or write) of file or folder. On Windows XP this may only reflect the nearest hour. Also see tip below. Note: The following media tags may be associated with audio, video or ? - tagging of media files allows many options! Executing this command creates the required registry entry and enables automatic updating of Date Accessed. Updating can be disabled by setting the value to 1. ✓ 2 Type Local Disk, CD Drive, Removable Disk, Folder, etc. Comments provided by Windows - folder function, drive details, etc. ✓ 5 Location user assigned? network?